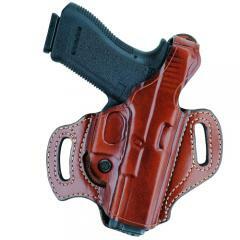 The 168 FlatSider XR12 Holster from Aker is designed for comfort as well as concealment. The molded pocket is formed away from the body, leaving the inner side totally flat. Curved belt slots on either side pull it in tight for enhanced concealability and stability. The holster pocket includes a full-length sight channel and a dual-plane muzzle that fits standard and shortened barrels, making it compatible with a wider range of firearms. The thumb break improves retention and weapon security without preventing a fast, natural draw, while the adjustable tension screw provides a secure fit and doubles as a trigger guard stop. Very nice and comfortable. Bought mine for Glock 20 full size and heavy. This holster handles this weight very well. I love these Akers holsters. Very comfortable. Everything I was looking for and couldn't find any where else, especially at a great price. Construction very good. By using the plastic bag the holster arrived in to help stretch the leather has made the fit perfectly. My only concern is when I tighten my belt it is more difficult to draw from holster. Great comfort and ease of draw. Re-holstering is smooth. Very secure with adjustable tension. First impressions: Amazing leather work. Molded perfectly for my S&W M&P 40c. Stitch work is rugid and shows no loose endsstitch patterns or knots. Belt loops are strong, stiff and patternedmolded perfectly for a large belt. The flatside design makes carrying a very comfortable and safe activity. No need for stretching the leather except for the retention strap just after a few good twists and pulls it fits perfectly over the back of the weapon. Good retention, especially with the adjustable retentiontrigger guard stop. Little to no part of the barrelsight channel stick out of the bottom of the holster. Ordered on the Wednesday before Thanksgiving, mailed Monday, shipped to my front door by Thursday. WORTH EVERY PENNY. The holster is great. The one for the Glock 30 takes a little more breaking in than one I have for a Glock 19. However, I have been wearing the Glock 19 holster every day for three years and it holds up well. what size are the belt loopswhat belt widths will it accommodate? Slides onto belts up to 1.75"
Your site just indicates M&P Shield but not the calibres associated.Just making sure that this holster will fit the M&P Shield 45 before I order it. Wil it fit that calibre? Per Aker, it fits all calibers. What color is the tan on this holster? Is it the color demonstrated with the gun or the lighter color shown on the check box? Thanks for the help. I carry a Sig 226R without any accessories on it. I'm guessing I still need the holster for the 226R. Yes, this holster will fit a Sig Sauer P226R with rail.